Sarah McNeal is an Extractive Industries Policy Assistant at Oxfam America. As the SOMO analysis illustrates, the information required (e.g. tax payments) or encouraged (e.g. investment agreements) to be disclosed by companies under standards such as the Extractive Industries Transparency Initiative (EITI) – or by tax payment disclosure laws in Canada or the European Union – can help reveal potentially abusive tax practices. Such multi-million dollar losses have real consequences for the citizens who should be benefitting from the revenue generated by resources in their countries. Let’s take a closer look at the Mongolia case. Mongolia, sometimes referred to as “Mine-golia”, is highly dependent on its mineral resource wealth. Mining products and precious metals made up 87 percent of Mongolia’s total exports for an estimated value of $4.2 billion in 2016. At the same time, poverty levels remain persistently high. The National Statistical Office reported that 29.6 percent of the population lived below the national poverty line in 2016. The Oyu Tolgoi mine is one of the largest operating copper mines in the world – so large, in fact, that the mine is expected to make up 30 percent of Mongolia’s GDP when it reaches peak production. The mine is jointly owned by the Government of Mongolia (34 percent) and the Vancouver-based Turquoise Hill Resources Ltd. (66 percent), which is itself majority-owned by global mining giant Rio Tinto. As SOMO’s Mining Taxes report highlights, the Mongolian government was unable to raise the necessary capital to finance its portion of the project directly. Thus, Turquoise Hill is currently covering the government’s contribution through an intercompany loan, with the government’s payments being deducted from any future dividends. 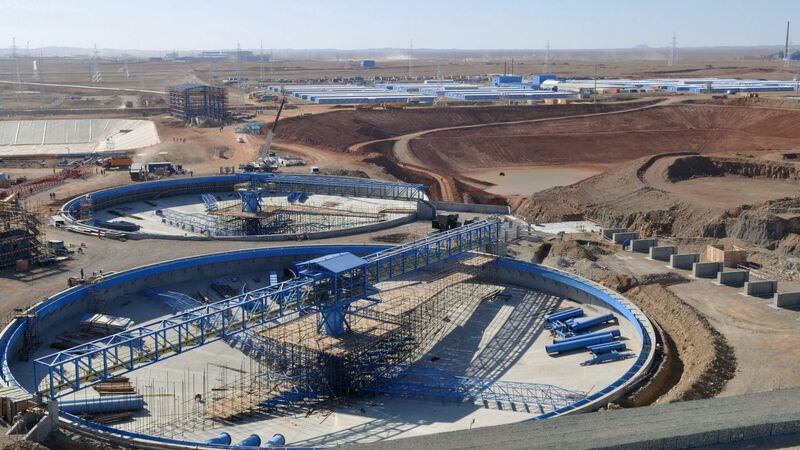 However, Turquoise Hill is not lending the money directly to Oyu Tolgoi LLC – instead, the funds flow through a chain of subsidiaries in Luxembourg and the Netherlands. As it turns out, it is easy to set up “shell companies” – companies that meet the legal requirements for substantial presence on paper but otherwise have no real office or staff – in both Luxembourg and the Netherlands. In Turquoise Hill’s case, the Luxembourg subsidiary has one part-time staff and the Netherlands office has zero. SOMO points out that these arrangements allow corporations to take advantage of preferential tax agreements without establishing full-fledged operations in those countries. For instance, when the Oyu Tolgoi Investment Agreement was signed in 2009, both Luxembourg and the Netherlands were party to double tax agreements (DTAs) with Mongolia that reduced withholding tax payments from the standard 20 percent to 10 percent and 0 percent respectively. After an IMF report in 2012 declared that these particular agreements could be used to facilitate tax avoidance, Mongolia unilaterally terminated the DTAs. However, thanks to the stabilization clause within the 2009 mine Investment Agreement, the original tax rates still applied to Oyu Tolgoi. The withholding tax rate was further negotiated down from 10 percent to 6.6 percent (applied retroactively) in 2015 following a disagreement between the government and Turquoise Hill over the financing package for the second phase of the mine. SOMO calculates that if Mongolia’s 20 percent withholding tax rate had been in place, the government could have collected an additional $230 million in taxes from 2011 to 2015 on the outgoing loan interest payments to Turquoise Hill, allowing Mongolia to double its spending on education and health care. Instead, in 2017 Mongolia accepted austerity measures as part of a $5.5 billion bailout package from the IMF, including a significant hike in personal income tax rates. Moreover, by holding the interest profits in Luxembourg (with an effective tax rate 2010-2016: 4.19 percent) rather than Canada (average tax rate 2010-2016: 26.6 percent), SOMO estimates that the company also avoided up to $470 million in tax payments to Canada. In response to these claims, Turquoise Hill argued that both the Canadian and Mongolian governments approved the tax arrangements and that the company was operating in full compliance with the law. Turquoise Hill also pointed out that the presence of a Bilateral Investment Treaty (BIT), not the DTA, between Mongolia and the Netherlands was the driving force behind opening a Dutch subsidiary. BITs are another common tool used by companies to protect their investments. Most treaties contain arbitration clauses that allow companies to sue governments over regulations they perceive as harmful to their business interests, which may include changes in corporate income tax rates. Unfortunately such tax practices are the norm, rather than the exception, within the extractive industries. For instance, another Canadian company, Caledonia Mining Corporation, allegedly took advantage of a DTA between the UK and Zimbabwe to reduce its interest and dividend withholding tax payments to almost nothing. And in December a number of oil, gas and mining giants were accused of adopting similar tactics to avoid paying taxes in Australia. While there has been a lot of progress on improving the disclosure of taxes paid through payment disclosure laws and the EITI, it is disappointing to learn that many of the same companies supporting EITI are involved in these practices. The Oyu Tolgoi case suggests that in addition to strengthening global transparency standards, Oxfam and our allies must continue the coordinated effort on a broader tax justice agenda, including closing the legal loopholes that allow these questionable behaviors to persist. The Netherlands has recognized the need to address such abuses and recently proposed minimum substance requirements for companies, including wage expenses of at least EUR €100,000, to prevent shell companies from enjoying tax treaty benefits. This complements the Dutch government’s commitment to insert clauses against treaty shopping into all of its tax treaties. Other governments should, at minimum, follow the Dutch example and take stronger action against tax abuses. Without such commitments and rule changes, there may be many more stories like Oyu Tolgoi in the future.